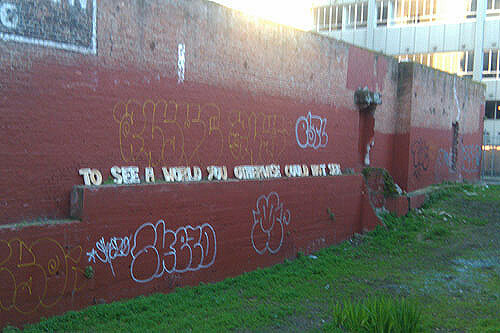 It's always nice to stop and smell the roses or, if you're in SF, to stop and read the brick wall. You might just discover a mural in an alleyway or find a little surprise on the side of an abandoned building. I love this cardboard graffiti: it's portable, compostable, and equal parts weird and thought-provoking. Just reading it makes me feel like I'm part of some deeply abstract art experiment. Sounds like this little lady just found herself a street cred-building craft project. And a little fun fact, did you know that the singular of graffiti is graffito? I can't wait to sprinkle that one into conversation and annoy some unsuspecting victims (aka friends), feel free to do the same.